When approaching the small town of Denmark, located in Bamberg County, it is hard to miss the beautiful dogwood blossoms that adorn its water tower. They were designed by renowned local artist Jim Harrison to commemorate the Dogwood Festival held here each year. Artist Jim Harrison grew up in Denmark and has lived there most of his life. Even though his talent as an artist has taken him to large cities such as New York and San Francisco, he chose to have his gallery in Denmark. Harrison’s love of small towns and rural life is very evident in his work. Peggy Williamson tells us that Harrison’s career in art began over 50 years ago as an apprentice sign painter. He helped his mentor, J. J. Cornworth, paint advertisements such as Coca-Cola signs on barns and country stores. Harrison’s gallery is located in the same building where he learned the basics of art so many years ago. The gallery features original paintings as well as prints from his long career as an artist. 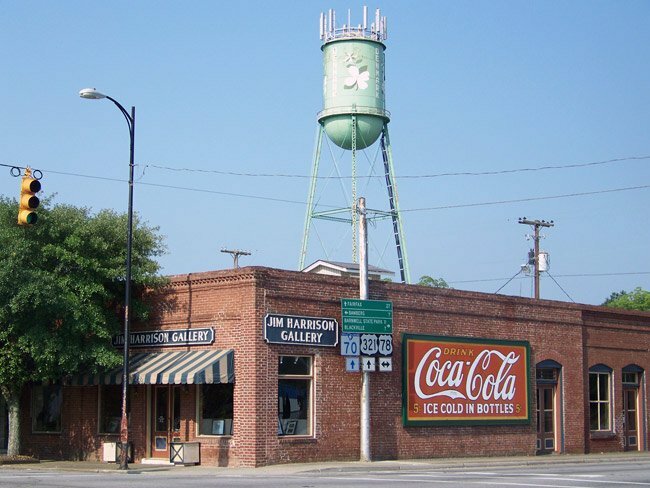 Located at 4716 Carolina Highway, the Jim Harrison Gallery is open to the public. 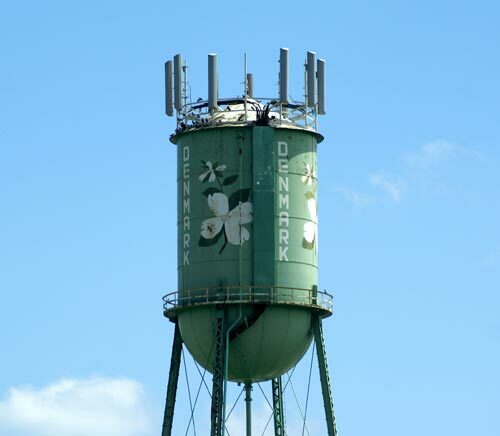 Thank you very much for showcasing my photo of the Denmark water tower. I’ve never seen one like this and I think it is beautiful.